Almost three years ago, Tom Brughmans sent me an email to see if I’d be interested in some kind of academic exchange. At the time, he was at the University of Konstanz and there is a state-province level exchange program that we could apply to. ‘C’mon over!’ said I, and soon Tom, Iza Romanowska, and their two wee babies arrived in Ottawa. We began by looking at the collection of board games in MacOdrum Library. What games did we like? Why did we like them? What problem space (as Jeremiah McCall terms it) do they address, and how? What is the key issue in our own research that a board game could address? I have a giant whiteboard in my office, and we started sketching these ideas out. Tom and I have both written and created simulations of Roman economics, and we have both explored Roman archaeology from a network perspective, so it made sense to us to use these experiences as points of departure. Earlier in the year, I had also participated in the Interactive Pasts conferences, giving a paper on agent simulation as ‘games that play themselves‘. This got me to thinking about the differences between agent models, video games, and board games, and we started thinking about board games as being ‘analog simulations’ that encouraged modding, tinkering, and ‘house rules’. That is, unlike a video game that makes you perform its creators’ ideas about how the world-space works (and are thus very hard to see or contest – but not impossible) an analog game/simulation invites reflection on the rules and system. 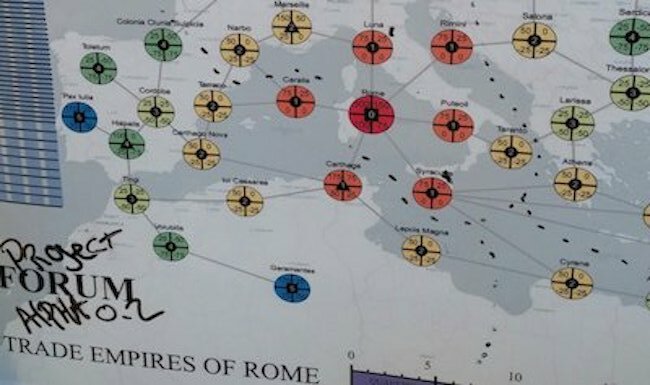 Thus we set out to make a game that reflects our perspective on the importance of network dynamics and information asymmetry in the Roman world, but that also invites its players to reflect on and perhaps alter/mod those rules for their own purposes. Once we had the game manufactured, we tried to have a copy sent to Tom and Iza so that we could reveal it and play it at a workshop Tom put on in Oxford in early October… but alas, that copy is somewhere in Spain, ping-ponging between different postal sorting offices, or slid down behind a radiator somewhere. A copy did make its way to me in Ottawa, and I asked my colleague Marc Saurette (who does an amazing semester-long seminar where the students role-play medieval politics) to play-test it one last time with his students. With a few tweaks in place, we are delighted to announce that the game is now available for purchase! It’s manufactured in the United States. If you’re ordering from a non-US location, make sure to select the international tracking option lest your copy go missing in the postal system too. 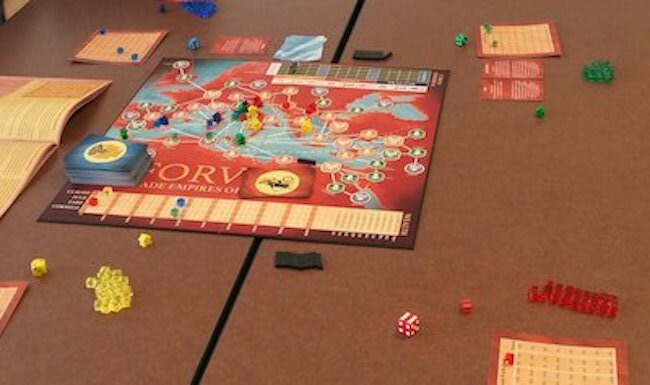 The game has its own website at http://www.forvm.ca/ but you can purchase direct from the manufacturer at TheGameCrafter.com. We’re not making money on this; it’s all at cost, an exercise in getting our research knowledge out into the public sphere.